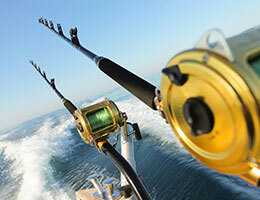 Find your Key West fishing charterboat at Party In Key West and you're bound to have a great time fishing. 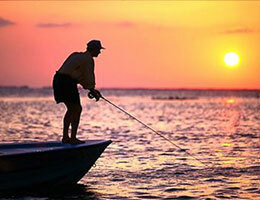 Anglers love to fish the reef, wrecks, flats and deep waters of Key West and the Florida Keys. Book your key west fishing trips with many experienced fishermen. Don't have any fishing experience? Not to worry! The guides will teach you how to cast, troll and catch amazing fish of the Florida Keys. You can choose from our Key West party boats, to Key West deep sea, or Key West light tackle charters. You can even charter your own private boat and do some snorkeling or swimming along the way. Use our online Key West Party Guide to help you find the fishing charterboat in Key West you're looking for! Not many places in the world can you be on the amazing green waters of inshore Key West Flats Fishing. These lush and tropical waters are filled with spectacular sea life in search of the Key West grand Slam of tarpon, permit and bonefish – and you can catch this in one day on the beautiful Gulf of Mexico in our Key West waters. If flats fishing in Key West is not your thing, you can choose one of our Key West light tackle fishing charterboats to fish off of the hundreds of ship wrecks that wrecked off of the Gulf and the Atlantic waters both near and far. If Key West deep sea fishing what your choice of fishing, our spectacular blue water is filled with a plethora of fish species to catch only a few miles away. Our key West fishing guide has all types of fishing charterboats to choose from, whether you want to fish deep sea, inshore or offshore! Key West Fishing Charters on Party In Key West!